$2.95 Per Sheet of 18. For those who are searching for a beautiful navy blue wedding address label, this custom label is perfect for your special day. This label features two hearts joined which are made of stars and has a certain "sparkle" that adds to your theme. Individual Label Dimensions are 1.25" x 2.375" and are comparable to comparable to Avery® 6871 labels. These labels are a template that you fill out online and easily create your labels. These labels are printed and sold direct through Zazzle, which features the hightest quality print and products around. Please note these labels are easily editable, Zazzle makes it easy. These labels are sold in sheets of 18. Just select the quantity you need, fill out the template and complete your order. The great thing about Zazzle is that they have a sale going. Click here to check the coupon page. If you always keep an eye on their coupons you are sure to find a sale on invitations, sometimes up to 40% or 50% off...It truly pays to watch. 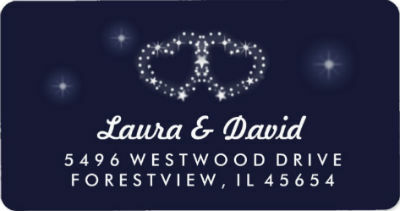 Navy Blue & White Stars & Hearts Wedding Address Label Easily create your perfect navy blue & white wedding address labels featuring these stars & hearts. Regular price: $2.95 $2.95 In stock! includes all Zazzle items on this site too! MAIN PRODUCT PAGES Graduation . . . . .
Halloween Invitations . . . . .
Halloween Postage Stamps . . . . .
Halloween Address Labels . . . . .
Dog ID Tags & Collars . . . . .
Service Dog ID Tags . . . . . Cell Phone Cases at Zazzle . . . . . Sympathy Thank You Cards . . . . .
Memorial Service Invitations . . . . . Wedding Invitations . . . . . WEDDING INVITATION COLLECTIONS Teal Moon & Stars Wedding Collection . . . . .
HALLOWEEN WEDDINGS 10 Great Halloween Wedding Zazzle Ideas . . . . .
Halloween Wedding Invitations . . . . .
Halloween Wedding Postage . . . . .
Halloween Wedding Place Cards . . . . .
Halloween Wedding Posters . . . . . Wedding Collection . . . . . Wedding Invitation Collection . . . . .
Holding Heart Wedding Collection . . . . . Invitation Collection . . . . .
ADDITIONAL WEDDING LINKS Wedding Speeches & Toasts . . . . .
Be a Fun Wedding Mc . . . . .
INFO Contact . . . . .
About . . . . . Copyright © JULIE ALVAREZ. All rights reserved.